Evergreen Sr. Sec. School was established in 1975 , by two great visionaries and dedicated educationists Mr. H.O. Thukral and Mrs. Muneesh Thukral. The CBSE affiliated Co-educational Senior Secondary School run by the Jyotirmay Bal Shiksha Samiti, has come a long way from its tiny sapling days and is today a giant oak tree spreading its branches to greater heights each day. At ESSS, standards of pedagogy are high and learning is marked by a sense of adventure. Our curriculum facilitates the process of discovery through an inter-active teaching-learning process where the freedom to question becomes the nucleus of learning in a classroom. A team of highly qualified, experienced and dedicated facilitators of learning make education a fun-filled process where students explore a plethora of exciting subjects through active participation in indoor and outdoor activities. The school assists learners in imbibing and preserving the rich age-old culture and heritage of India while striving to make them confident, competent and contributory global citizens. The school is located at a prime location in Vasundhara Enclave, East Delhi. Its grand edifice stands majestically representing the lofty ideals of honesty, integrity, truth and righteousness. This temple of learning has fully air conditioned nursery class rooms, well equipped laboratories, digital classrooms, library, music room, medical room, playgrounds and courts for different sports. The entire school premise is under 24 hours CCTV surveillance as the safety and security of the students reign prime for the School Management. Care & compassion: It is need of the hour to reach out to those who are lesser privileged than us and bring them at par with the rest of the society. Mujhe Pankh De Do project of the school in association with the Delhi State Literacy Programme intends to remove the pall of ignorance and spread the light of literacy amongst those who cannot afford the time and money. Respecting the feminine energy: Woman is the fulcrum of the society and need to be given their due respect. Creating awareness and working towards saving, protecting and educating girl child is of supreme importance. Environmental Consciousness: Understanding the havoc unleashed on the environment by man and adopting corrective measures to restore what can be salvaged, working towards environmental conservation is vital so that future generations can breathe easy. 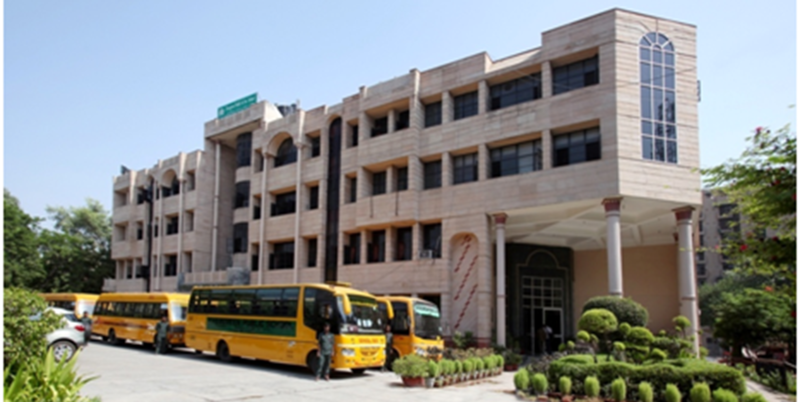 The school is located at a prime location in Vasundhara Enclave, East Delhi. Its grand edifice stands majestically representing the lofty ideals of honesty, integrity, truth and righteousness. Nursery classrooms are colourfully decorated and fully air conditioned. The wing has gentle and loving Mother-teachers and caring attendant aunties to provide ease and comfort to the little ones who are grappling with separation anxiety and learning to settle down in a new environment. The section has separate washrooms and is kept out of bounds for older students. Attendants take utmost care in escorting the tiny tots to and from the washrooms. The well equipped laboratories, digital classrooms, library, music room, medical room, playgrounds and courts for different sports.